Yahoo’s advanced products group, led by Scott Gatz, is launching a new service this evening called Kickstart. While immediate analogies will be drawn to Facebook, the service is actually much more like LinkedIn in that it connects students and alumni at specific colleges and universities and helps them connect on a professional level. Alumni can help students get jobs (or can find good students to fill spots at whatever company they work at), and students can reach out to others to help jumpstart their professional career. 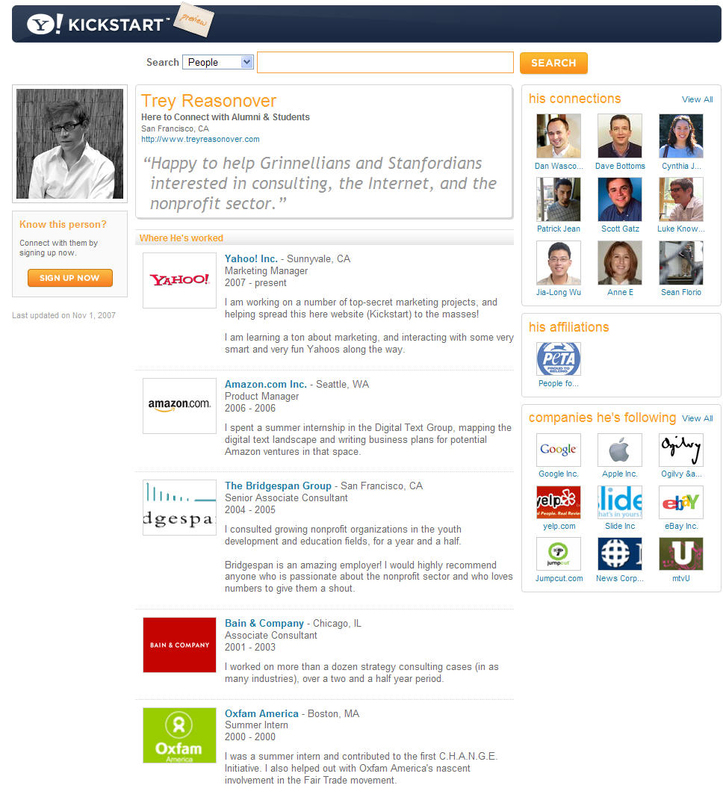 Doostang, an invitation-only job network which just raised $2.5 million, is also a point of comparison. New users sign up for the service and add basic college and work information (by choosing a college, they also choose a network). Users are automatically connected to others than went to, or are going to, the school. And they can make other friends in the network as well. Once the network gets started, Gatz says they’ll start to focus on events, message boards and other features. 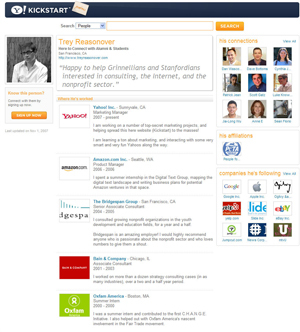 Eventually recruiters will be let in (Gatz promises not to let them spam users) as well. Kickstart is focusing on getting alumni to sign up first, and will be offering a $25,000 prize to whichever college/university gets the most alumni to sign up before December 31. What I liked about the service when I saw a demo last week was the possibility to find a deep database of individuals that went to the same schools that I did. And this clearly isn’t a place for pictures of partying and drinking – the whole point is to build up a professional network to help you move your career along. For young students just getting out of college this can be a very useful service. And they can keep having fun on Facebook…while pointing potential professional contacts to their Kickstart profiles. Yesterday we covered a number of startups that are trying to recreate the college-only magic of Facebook. 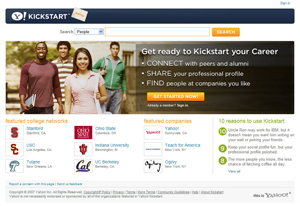 Kickstart isn’t one of those services, but college students may be flocking to it nonetheless. You can see the whole team behind Kickstart here.